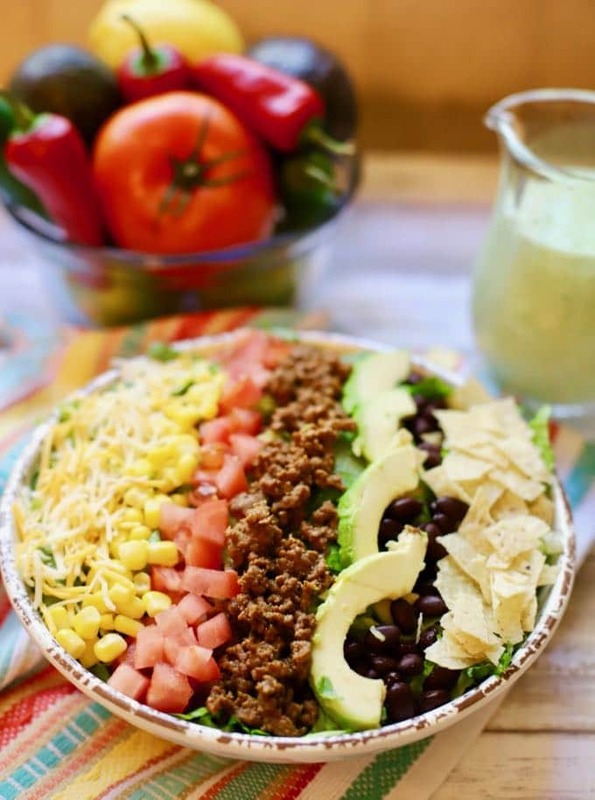 Have you ever wondered how to make a taco salad that is both delicious and healthy? How about my Beef Taco Salad with Avocado Cilantro-Lime Dressing? Are you looking for a quick and easy taco salad with a yummy dressing recipe that your family will love? How about my Beef Taco Salad with Avocado Lime Dressing? Yes on both counts! You are definitely in the right place! Beef Taco Salad with Avocado Cilantro-Lime Dressing has all of the elements of a perfect taco salad. 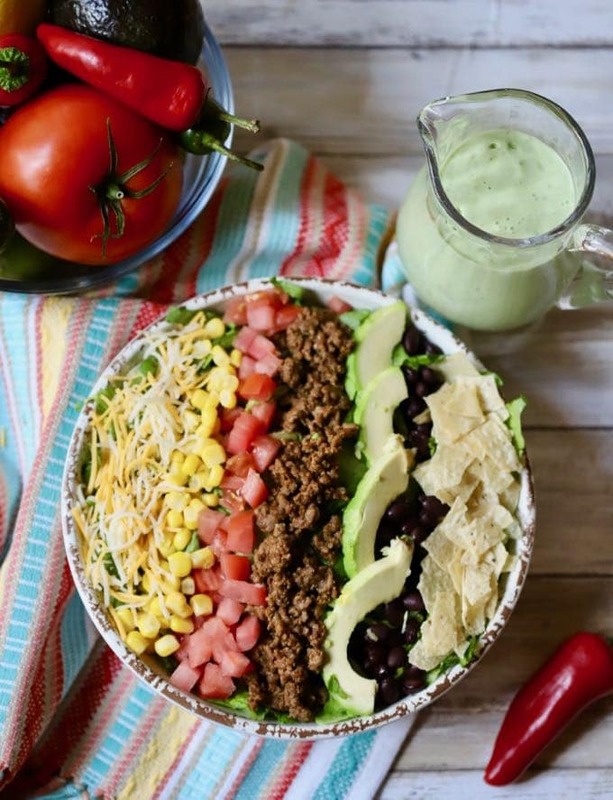 Delicious taco meat seasoned with just the right amount of spices, yummy black beans and corn, creamy avocado, crisp romaine lettuce, juicy tomatoes, shredded cheese and crunchy tortilla chips make up this main-dish salad. I put the leftover dressing on everything, baked potatoes, eggs, roasted veggies, french fries, burgers, you name it. I cannot think of anything that it wouldn’t make even more delectable! Wondering how to make this beautiful quick and easy salad? Well, it only takes about 20 minutes to get this appetizing and easy Beef Taco Salad with Avocado Cilantro-Lime Dressing on the table, so it’s perfect for a weeknight meal. Your small and big kids will love it, and you will be in and out of the kitchen in no time. This simple ground beef taco salad is also perfect for company because you can make everything ahead so you can spend time with your guests instead of standing over a hot stove. 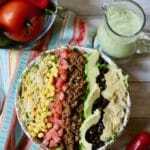 Beef Taco Salad with Avocado Cilantro-Lime Dressing is versatile, you can easily swap out the ground beef for chicken or turkey, or you can make it vegetarian by simply leaving out the meat. It will still be delicious. You could also save a few minutes by using prepackaged taco seasoning, but by using your own spices, you control the amount of sugar, salt, and preservatives in the dish, and that makes it even healthier! Special thanks to Anna Jones RD for sharing the taco seasoning recipe with me. If you like this easy Beef Taco Salad recipe, you might also want to check out my easy recipes for Fish Tacos with Mango Salsa, Easy Slow Cooker Pulled Pork Tacos or Easy Salsa Verde Chicken Tacos. The ingredients for Beef Taco Salad include ground chuck, romaine lettuce, tomatoes, avocado, shredded Mexican cheese blend, tortilla chips, corn, black beans, chili powder, paprika, onion powder, salt, garlic powder, cumin, oregano, pepper and red pepper flakes. 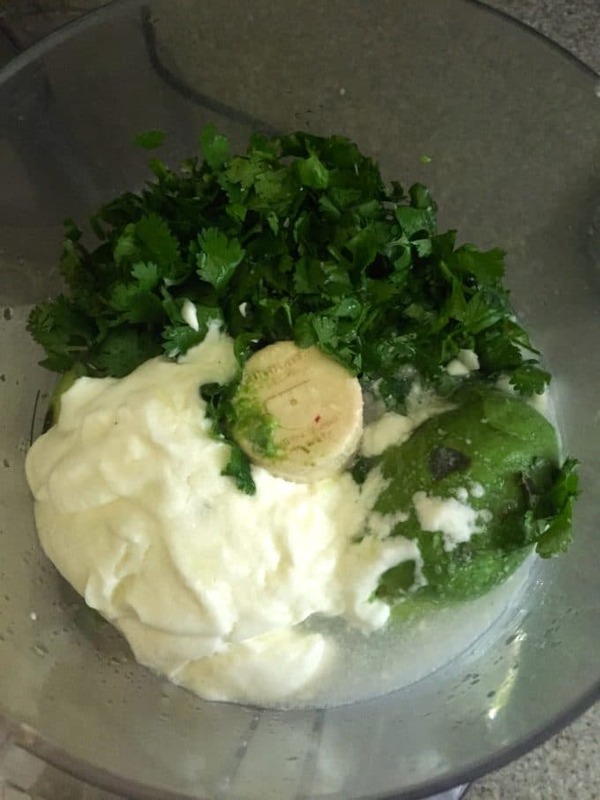 The ingredients for the creamy Avocado Cilantro-Lime Dressing are avocado, Crema (you can substitute sour cream or plain greek yogurt), cilantro, garlic, salt and fresh lime juice. Optional garnishes include jarred or homemade pico de gallo, and/or salsa. For the avocado cilantro-lime dressing, add all ingredients to a food processor fitted with a steel blade. Process until the mixture is smooth and creamy. Add a little more water if you desire a thinner dressing. Cover and refrigerate until ready to use. 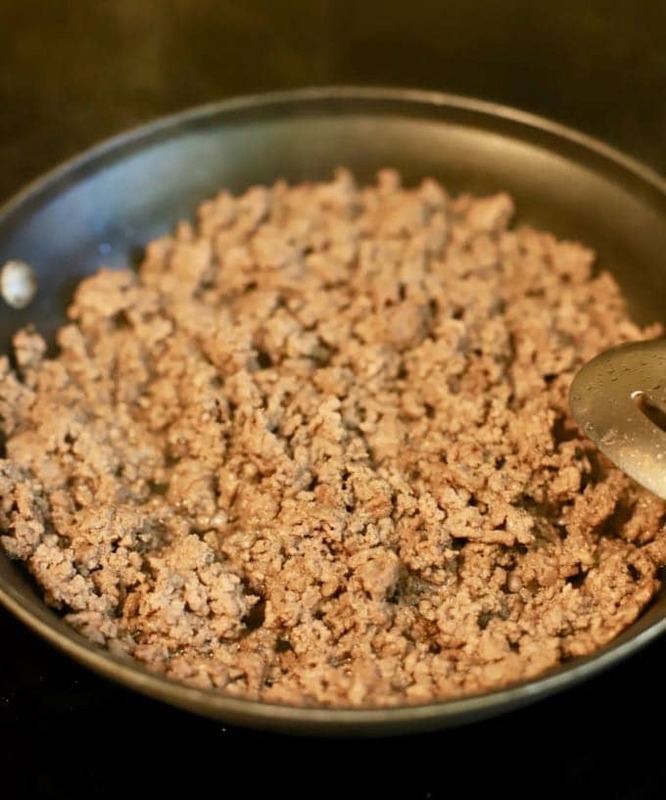 Add the beef to a large skillet over medium-high heat. Break up the meat with a wooden spoon and cook for about 5 minutes until the meat is no longer pink. Stir frequently. Add the taco seasoning mix and 1/3 cup of water and mix well. Reduce the heat to low and simmer for about 4-5 minutes or until the water has evaporated. Remove from the heat and set aside. To assemble the salad, add the lettuce to a large bowl or platter. Then add the beef, shredded cheese, tomatoes, black beans, corn, tomatoes, avocado and tortilla chips. Add the Avocado Cilantro-Lime Dressing and serve with pico de gallo, or salsa if desired. Serve immediately. Enjoy! 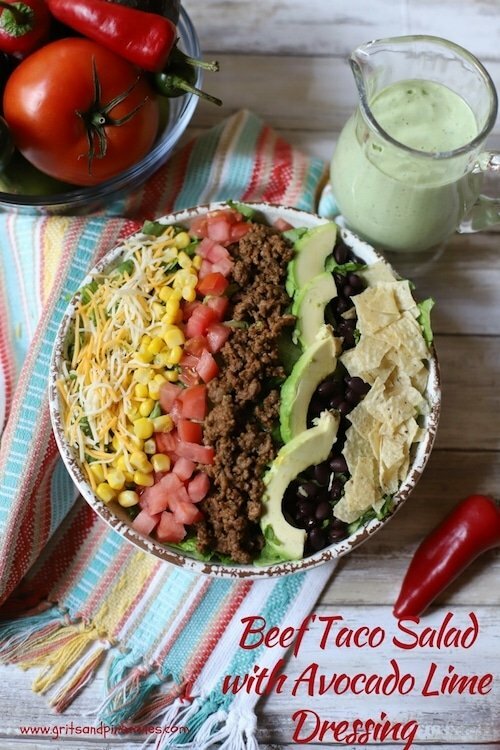 This beef taco salad is both delicious and healthy! It's also quick and easy to make and features a yummy avocado cilantro-lime dressing that your family will love. Combine all of the dry ingredients in a small bowl and mix well. Cover and set aside. Add all ingredients to a food processor fitted with a steel blade. Process until the mixture is smooth and creamy. Add a little more water if you desire a thinner dressing. Cover and refrigerate until ready to use. To assemble the salad, add the lettuce to a large bowl or platter. Then add the beef, shredded cheese, tomatoes, black beans, corn, tomatoes, and avocado. Top with tortilla chips and the Avocado Lime Dressing. If desired serve with pico de gallo or salsa. Serve immediately. Enjoy! This is a beautiful taco salad. The avocado lime dressing rocks! Carolyn Haley mentioned that you were a fellow local blogger. Love your blog. Consider me your new follower.